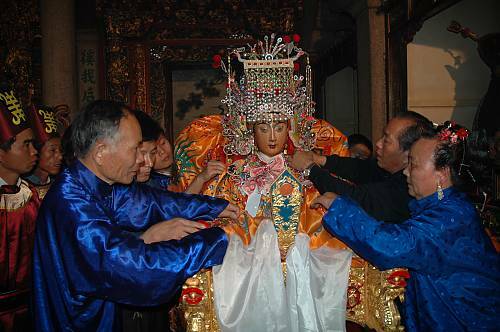 As the most influential goddess of the sea in China, Mazu is at the centre of a host of beliefs and customs, including oral traditions, religious ceremonies and folk practices, throughout the country’s coastal areas. Mazu is believed to have lived in the tenth century on Meizhou Island, where she dedicated herself to helping her fellow townspeople, and died attempting to rescue the survivors of a shipwreck. Local residents built a temple in her honour and began to venerate her as a goddess. She is celebrated twice each year in formal temple fairs, when Meizhou residents, farmers and fisherfolk temporarily suspend their work to sacrifice marine animals, venerate statues of Mazu and enjoy a variety of dances and other performances. Smaller worship ceremonies take place throughout the year in the other 5,000 Mazu temples around the world and in private homes; these may involve floral tributes; candles, incense and firecrackers; and evening processions of residents bearing ‘Mazu lanterns’. Followers may implore the god for pregnancy, peace, the solution to a problem or general well-being. Deeply integrated into the lives of coastal Chinese and their descendants, belief in and commemoration of Mazu is an important cultural bond that promotes family harmony, social concord, and the social identity of these communities.